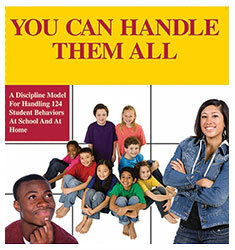 The You Can Handle Them All Behavior Model presents a complete step-by-step approach to changing inappropriate behavior to appropriate behavior. Behavior: Specific attitudes and actions of the student at home and/or at school. Pinpointing the students’ observed or expressed behavior is vital because it identifies the exact characteristics of the behavior. It helps teachers and administrators to avoid generalizing and enables them to zero in on the behavior they want to change. It also helps in describing the specific problem behavior to the student, colleague, and parents. Effects: How the behavior affects teachers, classmates, and parents in the school learning environment and the home family situation. It is important to be able to point out how the behavior actually affects the teacher, classmates, and/or the learning environment in the classroom. Failure to correctly identify the effects of the specific misbehavior robs educators with the vision necessary to see the adjustments needed to get the student to change the behavior. Action: Identifying causes of misbehavior, pinpointing student needs being revealed, and employing specific methods, procedures, and techniques for getting the student to modify or change his or her behavior. In this step consideration is given to the primary cause of the misbehavior, primary and secondary needs being revealed, and specific suggestions for handling misbehavior. Mistakes: Common misjudgments and errors in managing the student which may perpetuate or intensify the problem. Often our solution to misbehavior is to react to the behavior personally rather than approach the problem professionally. The purpose of this step is to help teachers avoid mistakes commonly made in dealing with certain types of behavior, because of how the behavior makes them feel.